The President of the Republic of Botswana, His Excellency Dr. Mokgweetsi E. K. Masisi, notes the importance of implementing commodity-based trade of beef for Ngamiland in his 2018 State of the Nation Address. * Welcome to the latest issue of the AHEAD Update. As always, if you would like to post an item in the next Update, please just send it to us – thanks. ...It is, however, worth noting that Government in partnership with international technical partners has undertaken numerous workshops to capacitate both farmers and extension staff on the concept of Commodity Based Trade (CBT), which provides an avenue for the exportation of meat from FMD endemic areas such as Ngamiland. CBT as adopted by the Organization for Animal Health (OIE) and recognized by the World Trade Organization (WTO) provides a new opportunity for safe trade in beef and beef products for Ngamiland farmers. We of course remain committed to assisting His Excellency Dr. Mokgweetsi E. K. Masisi, the Government of Botswana, and Botswana’s people in implementing commodity-based trade of beef, recognizing that this approach offers the unprecedented possibility of access to new beef markets for southern African farmers and pastoralists as well as unlocks the potential for restoring migratory movements of wildlife and thus enhancing prospects for long-term wildlife population viability within Botswana itself as well as in transboundary landscapes like the KAZA transfrontier conservation area. This new flexibility represents a true 'win-win' for sustainable and diversified land use and livelihoods, even in the face of some of the uncertainties related to regional climate change models. We commend the Government of Botswana for the vision shown in promoting public-private partnerships involving local communities, with all stakeholders motivated and encouraged by the fact that we are closer to reconciling foot and mouth disease-related conflict at the livestock / wildlife interface than we've ever been before. * Guidelines on Commodity-Based Trade Approaches for Managing Foot and Mouth Disease Risk in Beef in Southern Africa, 3rd edition (2018) Thomson G, Penrith M-L, Atkinson SJ, Osofsky SA, Cornell University’s AHEAD Program, http://wcs-ahead.org/kaza/181114-guidelines-for-implementing-cbt-final.pdf – Updated after very helpful discussions with the SADC Livestock Technical Committee, this 3rd edition includes additional material on risk mitigation measures such as a revised decision tree; a discussion of scenarios related to the transit of beef; and a new section on animal identification and traceability, among other topics. This document, like its previous editions, demonstrates that export of beef from SADC countries or zones not recognized as free from FMD is possible, especially to regional markets (because the sanitary circumstances that prevail in the southern Africa region are common to many countries). Furthermore, several alternative approaches, under the umbrella term commodity-based trade, are potentially possible, and this guide outlines those that comply with international trade standards as well as their respective advantages, disadvantages and requirements. Integration of sanitary risk management (i.e. for both food safety and animal disease) together with measures that improve the quality and quantity of the end-product along value chains offers an approach that, until recently, has been largely unrecognized, despite providing clear advantages for southern Africa specifically. We hope and believe this is the most helpful version of the Guidelines yet! * KAZA Transfrontier Conservation Area Animal Health Sub-Working Group (AHSWG) now has its own section on the AHEAD website – At http://www.wcs-ahead.org/kaza-ahswg/kaza-ahswg.html, you can find all of the materials of relevance to the AHSWG’s August 2018 meeting in Maun, Botswana (including an agenda with hotlinks to PDFs of the PowerPoint presentations, notes from the meeting, a photo gallery, etc.). Recall that the Animal Health Sub-Working Group functions under the official auspices of the KAZA Conservation Working Group, and was created so that veterinary challenges across KAZA can be addressed through a cross-sectoral, integrated approach. * A Fence Runs Through It: A Call for Greater Attention to the Influence of Fences on Wildlife and Ecosystems (2018) Jakes AF, Jones PF, Paige LC, Seidler RG, Huijser MP, Biological Conservation, https://doi.org/10.1016/j.biocon.2018.09.026 – Fencing is a nearly ubiquitous infrastructure that influences landscapes across space and time, and the impact of fences on wildlife and ecosystems is of global concern. Yet the prevalence and commonness of fences has contributed to their “invisibility” and a lack of attention in research and conservation, resulting in a scarcity of empirical data regarding their effects. Stakeholders, including scientists, conservationists, resource managers, and private landholders, have limited understanding of how fences affect individual animals, populations, or ecosystem processes. Because fences are largely unmapped and undocumented, we do not know their full spatial extent, nor do we fully comprehend the interactions of fences with wild species, whether positive or negative. To better understand and manage fence effects on wildlife and ecosystems, we advocate for an expanded effort to examine all aspects of fence ecology: the empirical investigation of the interactions between fences, wildlife, ecosystems, and societal needs. We first illustrate the global prevalence of fencing, and outline fence function and common designs. Second, we review the pros and cons of fencing relative to wildlife conservation. Lastly, we identify knowledge gaps and suggest research needs in fence ecology. We hope to inspire fellow scientists and conservationists to “see” and study fences as a broad-scale infrastructure that has widespread influence. Once we better understand the influences and cumulative effects of fences, we can develop and implement practical solutions for sustaining wildlife and ecosystems in balance with social needs. * ANIPEDIA – In the last few months, additional resources were added to Anipedia, a reference system and platform that includes the award-winning three-volume book Infectious Diseases of Livestock, as well as volumes on parasitic diseases, plant poisonings, and mycotoxicoses. The material is available online for veterinary, paraveterinary, and allied animal and human health professionals and students, stock owners, farmers, and the public at large. For details, see http://www.anipedia.org. For a free 2-month trial period, contact marketing@anipedia.org. * Wildlife Disease Association (WDA) 68th Annual International Conference, Tahoe City, California, USA, August 4-9, 2019 – This conference provides an interdisciplinary setting for wildlife health, conservation and management practitioners from around the world to exchange ideas, share best practices and give formal presentations on the latest in wildlife health. WDA includes many different professional specialties and you do not need to be a WDA member to participate. All interested individuals are invited to attend. Students also play a prominent role in the conference, with an entire day dedicated exclusively to student presentations. WDA encourages student participation, sponsoring several conference travel grants and student awards including two scholarships, a research recognition travel award, a best student presentation award, and a best student poster award. Abstracts are due by March 1st. For more information, please see https://wda2019.ucdavis.edu. Again, if you have items for the next AHEAD Update, please just let us know – thanks. "What is AHEAD?" Animal & Human Health for the Environment And Development was launched at the 2003 IUCN World Parks Congress in Durban, South Africa. By assembling a ‘dream team’ of veterinarians, ecologists, biologists, social and economic scientists, agriculturists, wildlife managers, public health specialists and others from across East and southern Africa, we were fortunate to have tapped into some of the most innovative conservation and development thinking on the African continent – and AHEAD was born. Since then, a range of programs addressing conservation, health, and concomitant development challenges have been launched with the support of a growing list of implementing partners and donors who see the intrinsic value of the One World, One Health approach. AHEAD is a convening, facilitative mechanism, working to create enabling environments that allow different and often competing sectors to literally come to the same table and find collaborative ways forward to address challenges at the interface of wildlife health, livestock health, and human health and livelihoods. We convene stakeholders; help delineate conceptual frameworks to underpin planning, management and research; and provide technical support and resources for projects stakeholders identify as priorities. AHEAD recognizes the need to look at health and disease not in isolation but within a given region's environmental and socioeconomic context. Please see the News Archives page for previous AHEAD Updates. 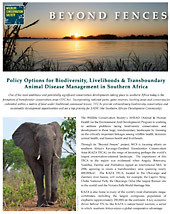 "Beyond Fences: Policy Options for Biodiversity, Livelihoods & Transboundary Animal Disease Management in Southern Africa"
de Política para a Biodiversidade, Meios de Subsistência e Gestão de Doenças Transfronteiriças dos Animais na África Austral"
Clique na página para visualizar. Para opção de descarregar o PDF, clique no botão direito do rato ou faça control-click. 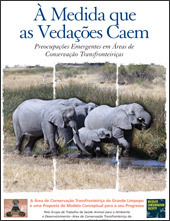 "À Medida que as Vedações Caem: Preocupações Emergentes em Áreas de Conservação Transfronteiriças"
Osofsky, S.A., Cleaveland, S., Karesh, W.B., Kock, M.D., Nyhus, P.J., Starr, L., and A. Yang, (eds.). 2005. Conservation and Development Interventions at the Wildlife/Livestock Interface: Implications for Wildlife, Livestock and Human Health. IUCN, Gland, Switzerland and Cambridge, UK. xxxiii and 220 pp. Our video clips use the Quicktime plugin. Animal & Human Health for the Environment And Development was launched at the 2003 IUCN World Parks Congress in Durban, South Africa. By assembling a ‘dream team’ of veterinarians, ecologists, biologists, social and economic scientists, agriculturists, wildlife managers, public health specialists and others from across East and southern Africa, we were fortunate to have tapped into some of the most innovative conservation and development thinking on the African continent- and AHEAD was born. Since then, a range of programs addressing conservation, health, and concomitant development challenges have been launched with the support of a growing list of implementing partners and donors who see the intrinsic value of the One World, One Health approach. AHEAD is a convening, facilitative mechanism, working to create enabling environments that allow different and often competing sectors to literally come to the same table and find collaborative ways forward to address challenges at the interface of wildlife health, livestock health, and human health and livelihoods. We convene stakeholders, help delineate conceptual frameworks to underpin planning, management and research, and provide technical support and resources for projects stakeholders identify as priorities. AHEAD recognizes the need to look at health and disease not in isolation but within a given region's socioeconomic and environmental context. In short, AHEAD recognizes the importance of animal and human health to both conservation and development interests. Around the world, domestic and wild animals are coming into ever-more-intimate contact, and without adequate scientific knowledge and planning, the consequences can be detrimental on one or both sides of the proverbial fence. But armed with the tools that the health sciences provide, conservation and development objectives have a much greater chance of being realized – particularly at the critical wildlife/livestock interface, where conservation and agricultural interests meet head-on. 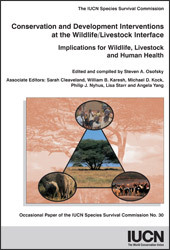 AHEAD efforts focus on several themes of critical importance to the future of animal agriculture, human health, and wildlife health (including zoonoses, competition over grazing and water resources, disease mitigation, local and global food security, and other potential sources of conflict related to land-use decision-making in the face of resource limitations). Historically, neither governments, nongovernmental organizations, the aid community, nor academia have holistically addressed the landscape-level nexus represented by the triangle of wildlife health, domestic animal health, and human health and livelihoods as underpinned by environmental stewardship.